When I became a father for the first time, at the ripe old age of 44, various historical contingencies saw to it that my nascent son would be sharing his home with two senescent canines. There was Nina, an endearing though occasionally ferocious German shepherd/Malamute cross. And there was Tess, a wolf-dog mix who, though gentle, had some rather highly developed predatory instincts. So, I was a little concerned about how the co-sharing arrangements were going to work. As things turned out, I needn’t have worried. During the year or so that their old lives overlapped with that of my son, I was alternately touched, shocked, amazed, and dumbfounded by the kindness and patience they exhibited towards him. They would follow him from room to room, everywhere he went in the house, and lie down next to him while he slept. Crawled on, dribbled on, kicked, elbowed and kneed: these occurrences were all treated with a resigned fatalism. The fingers in the eye they received on a daily basis would be shrugged off with an almost Zen-like calm. In many respects, they were better parents than me. If my son so much as squeaked during the night, I would instantly feel two cold noses pressed in my face: get up, you negligent father — your son needs you. The first question is whether I was correct to describe the behaviour of Nina and Tess in this way, as moral behaviour. ‘Anthropomorphism’ is the misguided attribution of human-like qualities to animals. Perhaps describing Nina and Tess’s behaviour in moral terms was simply an anthropomorphic delusion. Of course, if I’m guilty of anthropomorphism, then so too are myriad other animal owners. Such an owner might describe their dog as ‘friendly’, ‘playful’, ‘gentle’, ‘trustworthy’, or ‘loyal’ — a ‘good’ dog. On the other hand, the ‘bad’ dog — the one they try to avoid at the park — is bad because he is ‘mean’, ‘aggressive’, ‘vicious’, ‘unpredictable’, a ‘bully’, and so on. Nor are these seemingly moral descriptions entirely useless. On the contrary, it is a valuable skill to be able to assess these descriptions when an unfamiliar dog is bearing down on you in the street. If I’m guilty of anthropomorphism, so too, it seems, are many others. Eleanor, the matriarch of her family, is dying. She is unable to stand, so Grace attempts to help her, lifting and pushing her back to her feet. She tries to get Eleanor to walk, nudging her along gently. But Eleanor stumbles, and falls again. Grace appears very distressed, and shrieks loudly. She persists in trying to get Eleanor back to her feet, to no avail. Grace stays by the fallen figure of Eleanor for another hour, while night falls. If the figures that played out this grim tableau were human, we might have little hesitation in explaining what was going on in moral terms. Grace, we might say, was motivated by her sympathy for Eleanor’s plight. However, neither Grace nor Eleanor is human. Eleanor is the matriarch of a family of elephants, one that the British zoologist Iain Douglas-Hamilton and his colleagues have come to call the ‘First Ladies’ family. Grace is a younger, unrelated, member of another family, the ‘Virtues Family’. Grace is not unusual among elephants. Take another series of events: a young female elephant suffered from a withered leg, and could put little weight upon it. A young male from another herd charged the crippled female. A large female elephant chased him away and then, revealingly, returned to the young female and gently touched her withered leg with her trunk. Joyce Poole, the ethologist and elephant conservationist who described this event, concluded that the adult female was showing empathy. Binti Jua, a gorilla residing at Brookfield Zoo in Illinois, had her 15 minutes of fame in 1996 when she came to the aid of a three-year-old boy who had climbed on to the wall of the gorilla enclosure and fallen five metres onto the concrete floor below. Binti Jua lifted the unconscious boy, gently cradled him in her arms, and growled warnings at other gorillas that tried to get close. Then, while her own infant clung to her back, she carried the boy to the zoo staff waiting at an access gate. De Waal relates a similar story of Kuni, a female bonobo chimpanzee at Twycross Zoo in England. One day, Kuni encountered a starling that had been stunned during some misadventure. Fearing that she might injure the bird, Kuni’s keeper urged her to let it go. Kuni, however, picked up the starling with one hand, and climbed to the top of the highest tree in her enclosure, wrapping her legs around the trunk so that she had both hands free to hold the bird. She then carefully unfolded its wings and spread them wide open. She threw the bird as hard as she could towards the barrier of the enclosure. Unfortunately, it didn’t wake up, and landed on the bank of the enclosure’s moat. While her rescue attempt didn’t succeed, Kuni certainly seemed to act with good intentions, and tried to make amends by guarding the vulnerable, unconscious bird from a curious juvenile for quite some time. These examples merely scratch the surface of the evidence for apparently moral behaviour in animals. Much of it has been around for a long time but it has languished unrecognised. As long ago as 1959, the experimental psychologist Russell Church, now professor at Brown University, Rhode Island, demonstrated that rats wouldn’t push a lever that delivered food if doing so caused other rats to receive an electric shock. Likewise, in 1964, Stanley Wechkin and colleagues at the Northwestern University in Chicago demonstrated that hungry rhesus monkeys refused to pull a chain that delivered them food if doing so gave a painful shock to another monkey. One monkey persisted in this refusal for 12 days. This, however, is my favourite (delusional dog owner that I am, perhaps): a dog had been hit by a car and lay unconscious on a busy motorway in Chile. The dog’s canine companion, at enormous risk to its own life, weaved in and out of traffic, and eventually managed to drag the unconscious dog to the side of the road. I cringed my way through the video on YouTube, a site which is rapidly becoming the biggest single repository of evidence for apparently moral behavior in animals. While the evidence of apparently moral behaviour in animals is no longer in dispute — and cannot be restricted to mere anthropomorphic outpourings — how to interpret this evidence still is. Most scientists and philosophers are still sceptical of the idea that there is ‘real’ or ‘genuine’ morality at work here. This scepticism comes in two forms, one associated with scientists, the other with philosophers. Underlying scientific opposition is what has become known as Lloyd Morgan’s Canon, after the 19th-century British ethologist Conwy Lloyd Morgan. The basic idea is reasonable: when we explain animal behaviour, we should not postulate any more than we absolutely have to. In other words, we should not explain the behaviour of animals in complex, moral terms when another — non-moral — explanation is available. But are there other, non-moral, explanations for the sorts of cases described above? In some cases, the alternative, non-moral explanations can be almost endearingly desperate. In the case of Binti Jua who rescued the boy, some argued that since she had been hand-raised by zoo staff, who had taught her mothering skills by using a stuffed toy as a pretend baby, she was simply doing what she had been trained to do, believing that the unconscious boy was another stuffed toy. Yet this explanation, resting as it does on the assumption that a gorilla is incapable of distinguishing a boy from a stuffed toy (something a dog can do with a 100 per cent success rate) is astonishingly, and one suspects wilfully, naïve. In other cases, alternative, non-moral explanations appear more plausible. In the case of Russell Church’s rat experiment, for example, a rat’s failure to push the food bar might be explained not in terms of moral concern for its fellow rat but as an aversion to the noise made by a rat when it receives an electric shock. Indeed, this ‘aversive stimulus’ explanation is supported by the fact that white noise will have a similar affect on mice — they will refuse to push the food bar if doing so results in a loud blast of white noise. Lincoln was certainly ‘averse’ to the distress of the birds, but this aversion cannot be separated from his sympathy for them. If he didn’t care about the plight of the birds, then their distress would not have troubled his sleep. Lincoln’s aversion to their distress and his sympathy are, in this case, inextricably bound together: sympathy is the basis of his ‘aversion’. Secondly, the ‘aversive stimulus’ explanation can often seem curiously misdirected. After all, what explains an animal’s behaviour is not simply whether it finds a situation aversive: it’s how it responds to this aversion that is crucial. The apparently heroic Chilean dog in the YouTube video might well have found the sight of his companion lying prone on the road unpleasant or ‘aversive’. But there are various ways of escaping an aversive stimulus — walking away is the simplest. The fact that the dog didn’t walk away, but instead risked its life to save the other is, surely, significant. Perhaps Lloyd Morgan’s Canon itself is wrong. We might think of the Canon as akin to a game with a set of arbitrary rules: don’t give animals anything more than you absolutely have to. Assume only the bare minimum of cognitive abilities required to explain their behaviour. Ditto emotional sensibilities. Moral emotions — kindness, sympathy? Certainly don’t give them those unless there is no other choice. We know that we have cognitive and emotional capacities aplenty, and we know that we can, and often do, act for moral reasons. But don’t assume other animals are like us unless there is no other option. Here, courtesy of de Waal, is another possible game. We know that animals are like us in many ways — in terms of their evolution, their genetic structure, the structure of their brains, and their behaviour. Given these known similarities, when we see animals behaving in ways that seem to be similar to the ways we behave, then do not assume a difference in motivation unless there is some evidence that supports this difference. 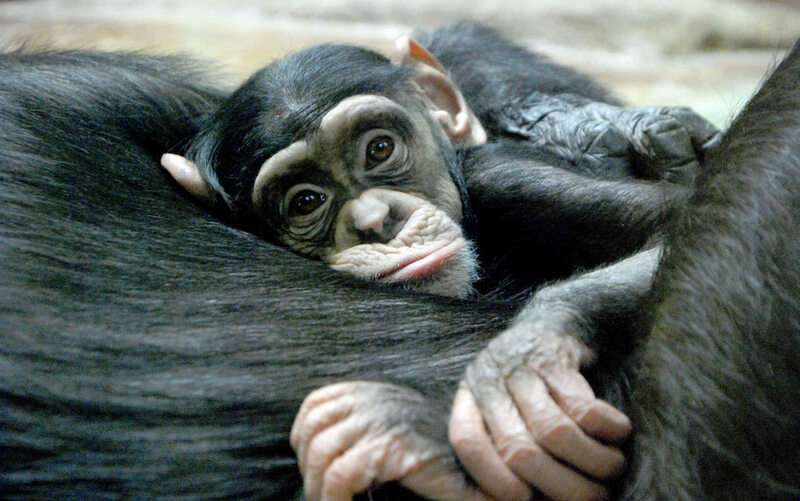 When a chimpanzee gives what appears to be a consoling hug to its fellow who has just received a savage beating from the alpha male then, in the absence of evidence to the contrary, the working hypothesis should be that the chimpanzee is motivated by the same sorts of emotions as a human would be in the same sort of situation. If, in the human case, we take this to be an expression of sympathy, then we should assume the same for the ape unless there is positive evidence to suppose otherwise. Many scientists assume that the Lloyd Morgan Canon is the only one in town, and few express any fondness for de Waal’s alternative. But it’s not clear that Lloyd Morgan’s game has any more legitimacy than de Waal’s. On the contrary, the Lloyd Morgan position seems to make sense only if we assume there is a drastic discontinuity between humans and other animals — an assumption that is becoming increasingly difficult to defend. The scepticism of philosophers towards the idea that animals can behave morally is subtly different from that of scientists. Scientists question whether there is enough evidence to support the claim that animals can be motivated by emotions such as kindness or compassion, or by negative counterparts such as malice or cruelty. Philosophers argue that, even if animals were to be motivated by these sorts of states, this is still not moral motivation. When they occur in animals, these states are not moral ones. For example, compassion, when it occurs in an animal, is not the same sort of thing as compassion when it occurs in a human. When it occurs in an animal, compassion has no moral status, and so even if the animal acts through compassion, it is still not acting morally. In a nutshell, this is the philosopher’s worry: moral action seems to imply moral responsibility. If I act morally, then I am, it seems, morally responsible for what I do. But do we really want to hold animals responsible for what they do? During the medieval era, it was not uncommon for courts of law to try (and often execute) animals for perceived indiscretions. I assume that no one wants to go back to those days, and underlying this reluctance is the thought that, whatever else is true of animals, they are not really responsible for what they do. But this seems to imply that they cannot act morally. Consider a principle associated with the philosopher Immanuel Kant: ought implies can. It doesn’t make sense to suppose that I ought to do something if I am incapable of doing it. Nor does it make sense to say I shouldn’t do something if I can’t help doing it. To say that you ought (or ought not) to do something is to imply that you have a say in the matter — that you are capable of choosing what it is you are going to do (or capable of refraining from whatever it is you are tempted to do). Moral motivations seem to imply that you have this ability. A morally good motivation is one that you ought to endorse or act upon. A morally bad motivation is one that you ought to resist. So animals can’t act morally, it seems, unless they are capable of deciding how they are going to act, and so are responsible for what they do — and then, it seems, we are back to medieval animal trials. Most philosophers have been united in their reasons for thinking that animals cannot be responsible for what they do. To be responsible requires an ability that animals do not have — the ability to scrutinise their motivations critically. To be responsible, animals must be able to think the following sorts of thought: I am inclined to do this; is this an inclination I should embrace or reject? Did the apparently heroic dog think to itself: ‘I am inclined to drag my companion to safety. Is this an inclination I should act upon or one that I should resist?’ According to philosophers, it is not simply that the dog didn’t engage in this sort of scrutiny of its motivation. What is crucial is that it cannot do this — it does not have the ability to scrutinise its motivations. Of course, human beings often act unreflectively, too — dashing into burning buildings to save babies, and so on, without a thought to the consequences. But the difference, philosophers say, is that we can scrutinise our motivations even if, in particular cases, we don’t. This is why philosophers have almost universally rejected the idea that animals can act morally: they assume that animals cannot perform this same self-scrutiny. Despite its widespread acceptance, I think this is incorrect. In the first place it is not clear that the requirement to critically scrutinise our actions is at all crucial to our own moral behaviour. Simply put, say I am inclined to help a dog I see lying unconscious in the middle of a busy road. Do I have control over this inclination? According to the standard philosophical view, I have control over it as long as I am capable of critically scrutinising it — of asking myself whether I should act upon this inclination or resist it. But recent work in psychology suggests that my responses can be skewed by environmental influences of which I am unaware and over which I have no control. We have a problem of regress here: the ability to engage in critical scrutiny of my motivations will give me control over them only if I have control over the critical scrutiny. Where does this end? We began with the problem of explaining my control over my motivations, but have merely substituted for this another problem: the problem of explaining my control over my critical scrutiny. We haven’t explained control at all, merely pushed the problem back a step. The traditional philosophers’ way of understanding the ‘ought’ of moral motivation in terms of rational control is questionable. There is another way of understanding morality that does not rest on this assumption. It is, for example, possible to do things that we ‘ought’ to do, even in the absence of critical scrutiny or rationalisation about alternative courses of action – acting prudently to ensure a long and healthy life, say, or caring for another being. This opens up a new way of thinking about the moral capacities of animals. Animals can, in fact, act morally even if they are not responsible for what they do. They can be motivated by the desire to do good (and also bad) things even if they are not responsible for their actions. A dog can be motivated by the desire to rescue his companion, and rescuing his companion is a good thing. But this does not imply that the dog is responsible for what it does. This allows us to make sense of the growing body of evidence that supports the idea that animals can act morally without returning us to the horrors of animals on trial.